Coming off of one of the biggest events of the year, Macon Speedway is carrying momentum to its stretch run on the 2015-schedule. This past Saturday’s KERBYSTRONG 100 drew the second largest car count of the season with 34 Super Late Models and over 100 cars overall. The rest of August will feature a variety of can’t miss events including Go-Karts this week, with the 1st ever Macon Speedway Eve of Destruction, the final POWRi Night of the year, and the rescheduled Herald & Review 100. The weekly stock car program is on hiatus for one week, as the Go-Kart organization from Cerro-Gordo comes to town for their annual show this Saturday night. 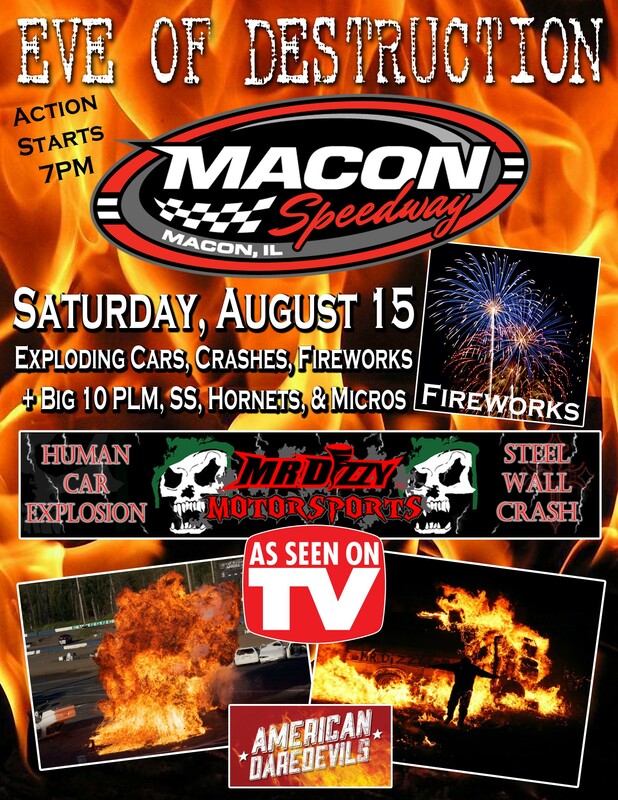 That means that the next event on the schedule is the 1st ever Eve of Destruction at Macon Speedway. The August 15 show will feature, world renowned, Mr. Dizzy, who has appeared on the History Channel’s tv show, American Daredevils. There will be a Human Car Explosion, a Steel Wall Crash, Fireworks, and more. The event will also have racing from the Midwest Big Ten Pro Late Models, Street Stocks, Micros, and Hornets. It will be the perfect mix of thrills and racing for entertainment seekers and race fans alike. Rounding out the rest of the month, POWRi will return for its final visit of the season on Saturday, August 22 with their Lucas Oil National Midgets and Speedway Motors Micros. The Billingsley Towing UMP Modifieds and UMP Street Stocks will also be on the card. Just four days later, Macon will be back in action with the rescheduled Herald & Review 100 for the Super Late Models. It is the makeup for the rained out Summernationals event. The Wednesday, August 26 event will also feature the Billingsley Towing Modifieds and B-Mods. The last event of the month will be on Saturday, August 29. On that night, the 11th annual Illinois Street Stock championship will be held for the Midwest Big Ten Series Street Stocks. The Billingsley Towing Modifieds, B-Mods, Hornets, and Beach House Micros will also compete. For information on the Go-Kart event, contact Tom Bennett at 217-519-2471.